NASA's Curiosity Mars rover has analyzed its 12th drilled sample of Mars. This sample came from mudstone bedrock, which the rover resumed climbing in late May after six months studying other features. Since the previous time Curiosity drilled into this "Murray formation" layer of lower Mount Sharp, the mission has examined active sand dunes along the rover's route, then crossed a remnant plateau of fractured sandstone that once more extensively covered the Murray formation. 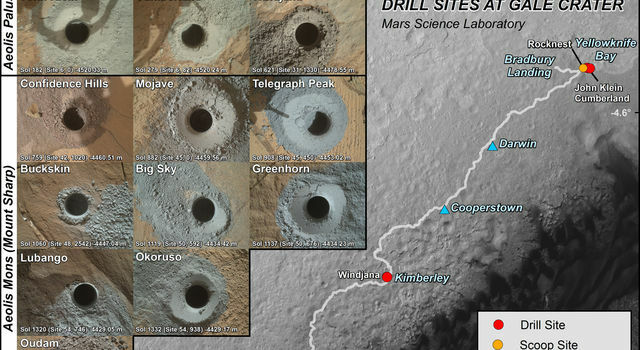 While on the "Naukluft Plateau," the rover examined its 10th and 11th drill targets to repeat an experiment comparing material within and away from pale zones around fractures. 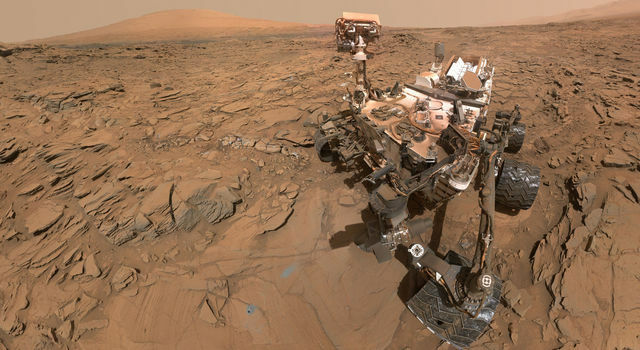 From there, Curiosity also took the latest in a series of self-portraits. "Now that we've skirted our way around the dunes and crossed the plateau, we've turned south to climb the mountain head-on," said Curiosity Project Scientist Ashwin Vasavada, of NASA's Jet Propulsion Laboratory, Pasadena, California. "Since landing, we've been aiming for this gap in the terrain and this left turn. It's a great moment for the mission." 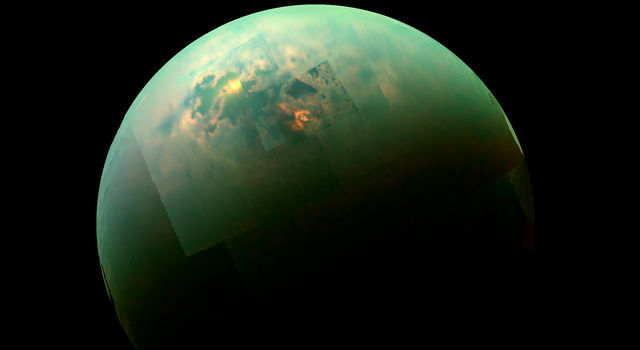 "The story that the Murray formation is revealing about the habitability of ancient Mars is one of the mission's surprises," Vasavada said. "It wasn't obvious from pre-mission data that it formed in long-lived lakes and that its diverse composition would tell us about the chemistry of those lakes and later groundwater." 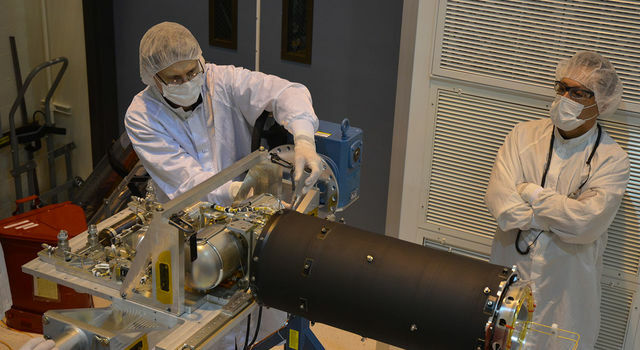 The latest sample-collection target, "Oudam," was drilled on June 4. On the Naukluft Plateau, Curiosity drilled "Lubango," within a halo of brighter sandstone near a fracture, and "Okoruso," away from a fracture-related halo, for comparison. The mission conducted a similar experiment last year, with two sample targets drilled at another exposure of the fractured sandstone. This sandstone unit, called the Stimson formation, is interpreted to have resulted from wind that draped a band of sand dunes over lower Mount Sharp. That would have been after the main stack of the mountain's lower layers had formed and partially eroded. Water later moved through fractures in the sandstone. Investigation of the fracture-related halos aims to determine how fluid moved through the fractures and altered surrounding rock. "We were about to drive off the Naukluft Plateau and leave the Stimson formation forever as we go up Mount Sharp," said Curiosity science-team member Albert Yen of JPL. "A few of us were concerned. The fracture-associated haloes were becoming more prevalent, and we had only one data point. With just one data point, you never know whether it is representative." 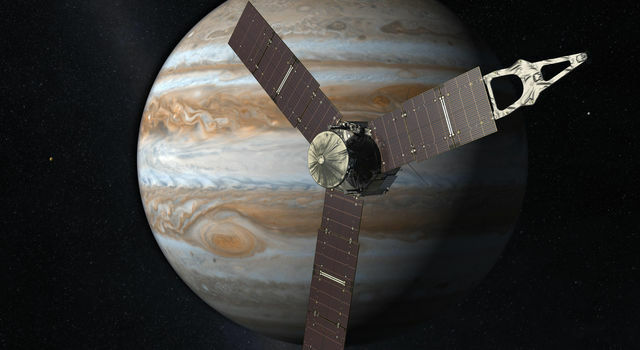 "The big-picture story is that this may be one of the youngest fluid events we're likely to study with Curiosity," Yen said. "You had to lay down the Murray, then cement it, then lay down the Stimson and cement that, then fracture the Stimson, then have fluids moving through the fractures."